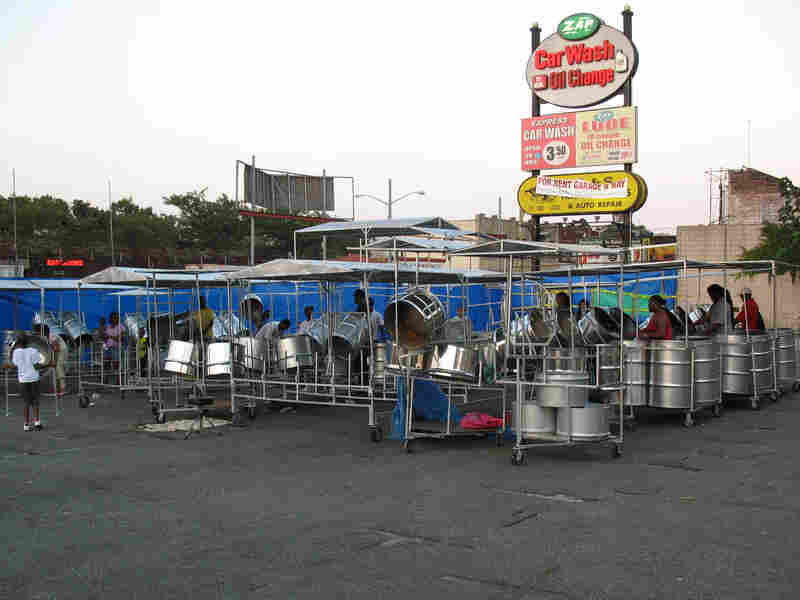 Bang On A Pan: Steel-Drum Orchestras Ready For Battle They gather in vacant parking lots every night in the summer, their ranks swelling to around 100 as they assiduously rehearse. It's all for the annual Panorama Competition in Brooklyn, where massive Caribbean-style ensembles vie for the steel-band championship. Despers USA warms up before a rehearsal. The steel band is preparing to enter the annual Panorama Competition in Brooklyn over Labor Day weekend. Despers USA practices on a big parking lot off Atlantic Avenue in Brooklyn, N.Y. Band members start wandering in around 6 or 7 p.m. and slowly take their places behind racks of steel drums. Like a symphony orchestra, they're organized by section — the thin tenors ringed around the outside; the big, deep, oil-drum basses toward the center; the midrange "guitars," as they're called, nearby. Their section leader counts them in. He stops them, and then stops them again, saying the opening needs to be stronger. Eventually, they get it. Around the corner from the Despers lot is a second steel band — about 20 players crammed into a smaller lot. Around the corner from that one, there's a third. The steel-band competition has taken over the block. Among the sounds of late summer in Brooklyn, there are the shouts of kid-packed playgrounds, the canned music from ice cream trucks roaming the streets, and, in certain neighborhoods, the lilt of steel-drum bands in vacant parking lots like these. The bands are ramping up to Saturday's Steel Band Panorama Competition — part of the annual West Indian American Day Carnival. The competition, like the steel drum itself, traces its roots to the Caribbean island of Trinidad. In Brooklyn, the competition is taking over the band members' lives. "It's hell, I'm not gonna lie," says Wilfred Kieal Jr., the captain of Despers. "It's sleepless nights, a lot of dedication and hard work." In the weeks leading up to the competition, Kieal goes straight from work to practice, leaves practice at 1 or 2 a.m., and gets a few hours of sleep before getting up and doing it all over again. Even when he's not near a steel drum, he says he's practicing. "I practice in my head literally day and night," Kieal says. "I'm actually seeing my sticks hitting every note. It's like I'm playing a video game. I'm playing every note in my head and I'm seeing it." In addition to daily practices, Panorama season is also jammed with "band launch parties." Each of the bands — 11 are competing this year — holds fundraising cookouts and concerts at its pan lot. These help them raise the $10,000 or so it takes to get the pans tuned and painted and shined, rent practice space, buy uniforms and meet the various other costs involved with getting a band to Panorama. These parties also give bands a chance to size up the competition. A half-dozen bands braved the rain on a recent evening to play Despers' launch. Among them was AdLib Steel Orchestra. Shanelle County plays "double second" pans with AdLib. She's 26 and has been with the group since she was 14. She says the band hasn't always gotten respect, in part because it's not based in Brooklyn. I practice in my head literally day and night. I'm actually seeing my sticks hitting every note. It's like I'm playing a video game. I'm playing every note in my head and I'm seeing it. "In Trinidad, it's called a Toco band, 'cause Toco's in the country," County says. "So when the band used to come down from Toco, people don't know what to expect. And the same thing for us: They look at us as the Long Island band, 'cause the other bands are in Brooklyn. So what we say, they sleep on us, they don't think we're coming with anything. Like, 'Oh, what do they know, they don't know how to play pan, they live in Long Island.' "
But AdLib won Panorama last year, and it's getting props now. "Oh, AdLib, yeah, the last year's champions — yeah, you have to watch out for them," Kieal says, laughing. Kieal is part of a younger generation that has recently taken over leadership of many of these bands. The groups were founded by their parents, first-generation immigrants from Trinidad. He says the older musicians did not hang out. "Back when I was a kid, you know, the elders used to run the band and they used to tell us, 'Listen, Panorama is war — you don't have any friends in other bands,' " he says. Now, though, a bunch of players get together on Tuesdays to bowl. Younger musicians have also brought in new songs — Lady Gaga's "Bad Romance," for one. As Panorama nears, the bands' ranks swell. Many end up with close to 100 players in the competition, up from the 15 or 20 they field the rest of the year. Bandleaders say it's a headache to pull everything together. County says, though, that once the competition starts, all the hassles evaporate. "It just comes with an energy when the lights go on, and you're onstage and you're lined up," she says. "It just gives you that extra adrenaline, that just keeps you going onstage for that 10 minutes. And ... in that 10 minutes, you would think we played a basketball game, the way we're sweating and everything. For me, it's an amazing experience." It's even more amazing, of course, for the band that takes home the first-place prize of $15,000.